START Executive Director Bill Braniff testified before Congress this month based on START research about Americans' attitudes toward both terrorism and counterterrorism strategies. The U.S. House of Representatives Committee on Homeland Security subcommittee hearing aimed to explore the Department of Homeland Security's communication with the public. 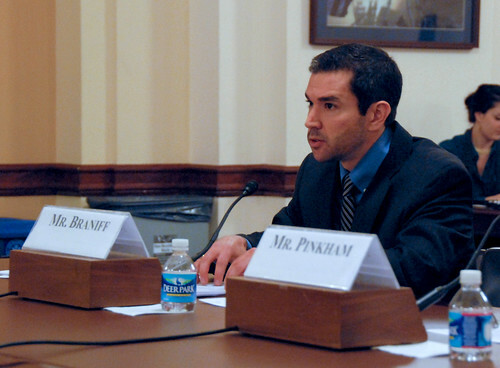 Chaired by Rep. Jeff Duncan (R-SC), the Subcommittee on Oversight and Management Efficiency invited Braniff to speak about START's research and his opinions on how DHS could improve its communication efforts. Braniff's testimony was largely based on the START survey of 1,567 American adults and resulting report, "U.S. Attitudes towards Terrorism and Counterterrorism," funded by the DHS Science and Technology Directorate's Resilient Systems Division. While the study highlighted the public belief that the U.S. government is addressing terrorism effectively, the study's research team suggests that increased government support for public outreach efforts and community-engagement programs would be well-received by the public and could be beneficial. A large majority of respondents said that the U.S. government has been very effective (33 %) or somewhat effective (54 %) at preventing terrorism. More than 56 percent of respondents had not heard anything about DHS' "If You See Something, Say Something" campaign, while 85 percent of those who had heard something about the program thought it would be very or somewhat effective. A majority of respondents indicated they would be willing to meet with representatives from DHS (57%) or representatives from local law enforcement (58%) to discuss issues related to terrorism.